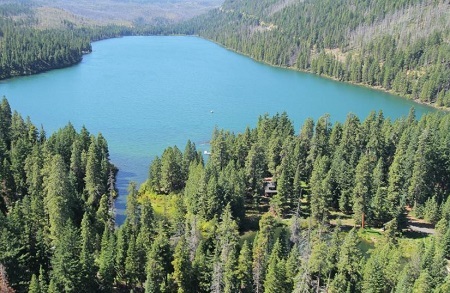 SISTERS, OR -- The Sisters Ranger District is working on a comprehensive plan to rid the Suttle Lake area of diseased and dying trees. District Ranger Ian Reid says they immediately cut down the most dangerous trees near recreation sites or campgrounds, but many others still need to come down in the 250-acre area. "We identify as imminent hazard trees, when we see those out there, we will fell those immediately. We won't wait for the analysis work that we're doing right now, but this is more for trees that are not termed 'imminent hazards,' but certainly have a lot of defects, with predominately mistletoe, so they have dead tops; and there are infrastructure developments underneath those trees." Reid says what's happening in the forest near Suttle Lake is normal, but the area's popularity makes it a bigger issue, "It's a special area for a lot of people; it gets a lot of public use, so that's what we're trying to do out there, make it safe for our visitors. We've had a couple tree strikes out there, with vehicles. Luckily nobody was seriously hurt." He tells KBND News, "There are a lot of diseased and dying trees that are interspersed among high use recreation areas. It's an older forest that has a fair amount of disease, a lot of it is mistletoe, but also other root rots, and typical tree diseases." In addition to taking out the hazard trees, Reid says he'd like to see planting of more disease-resistant species to keep the forest full and return it to health. A public open house, last week, allowed people to provide input on the tree removal project, and others. More feedback will be accepted online through Friday, April 19.